We propose in this paper an algebraic approach to hardware/software partitioning in Verilog HDL. We explore a collection of algebraic laws for Verilog programs, from which we design a set of syntax-based algebraic rules to conduct hardware/software partitioning. The co-specification language and the target hardware and software description languages are specific subsets of Verilog, which brings forth our successful verification for the correctness of the partitioning process by algebra of Verilog. Facilitated by Verilog’s rich features, we have also successfully studied hw/sw partitioning for environment-driven systems. The work is partially supported by NNSFC under grant Nos. 60173003 and 69983001. 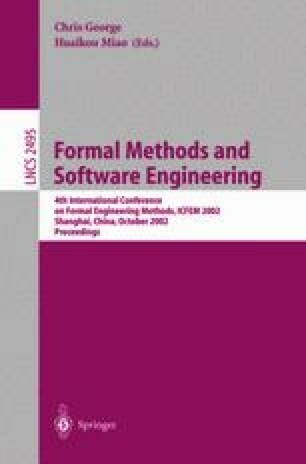 Qin S., He J., Qiu Z. and Zhang N., “Hardware/Software Partitioning in Verilog”, Research Report 2002-33, School of Mathematical Sciences, http://www.math.pku.edu.cn/printdoc/182.ps.